In his January 2014 State of the Union Address and thereafter, President Barack Obama has repeatedly mentioned apprenticeships and vocational education when discussing the jobs crisis. One might be critical as to why the nation’s first black president would advocate for a policy that has been historically exclusive and harmful to African Americans. In his autobiography, Malcolm X notes, when telling his middle school English teacher of his aspirations to be a lawyer, the teacher advised him to instead become a carpenter. To Malcolm, this was in stark contrast to the overwhelmingly affirming advice he gave to less-promising white students. Malcolm X’s case was not an aberration, but reflected a general trend of structural and systemic discrimination that operated through vocational education programs (where African Americans were tracked into lower-paying jobs) and apprenticeships. This history involved reifying and reinforcing class divisions along racial lines. Apprenticeships can be problematic in that often they are awarded to relatives or friends who share the same racial background as the master technician. As many have noted, white social networks often function to exclude African Americans from potential jobs. Exclusive policies designed to maintain white male privilege in American workplaces are still quite problematic. An apprenticeship program could be explained by Bonilla-Silva’s theory of colorblind racism; it would be a colorblind program on the surface, but could serve to reproduce the existing racial hierarchy by keeping white jobs white and excluding people-of-color from good jobs that pay a living wage. In fact, another recent work finds a major problem is not necessarily whites discriminating against people of color, but whites helping other whites and thus hoarding resources and opportunities while simultaneously expressing colorblind ideology. This is clearly a possibility in an apprenticeship system and obviously not desirable. President Obama has been criticized by a number of prominent African American scholars (most notably, Cornel West) and called-out for not making policies that adequately address the pressing needs of poor African Americans and other minorities. If apprenticeship programs could be such a nefarious means of excluding women and minorities from high-skill jobs, should they not be considered? Assuming he is aware of their sordid history, why would President Obama pursue such policies? There is substantial political pressure on the president to address the “jobs” situation in the U.S. These proposed efforts by President Obama seek to address the problem of heightened unemployment rates in recent years, which has led some to speculate that a structural shift in the labor market has occurred. Often the term “structural unemployment” is treated as synonymous with “skill mismatch”. I co-authored a new book with Thomas Janoski and Christopher Oliver titled The Causes of Structural Unemployment: Four Factors That Keep People From the Jobs They Deserve. Our book complicates this structural unemployment story by introducing three additional factors in the discussion of structural unemployment, but skill mismatch continues to be a factor. The basic problem is not that the labor force is untrained, but that the labor force is trained in areas where there is not substantial economic need; on the other hand, the labor force lacks training in areas of great need. So the skills possessed by laborers do not match the needs of the economy or the needs of employers. We explore the responsibility of the employer, the employee, and the state in dealing with skill mismatch. Solutions to the problem of skill mismatch often surround education reform. We propose a change in the education system that is highly influenced by the German system, which generates skilled laborers at the age of 18 who are eligible for good jobs and are needed in their economy. President Obama’s proposals, in some ways, fit with some of the educational reform recommendations we propose in our book. The education reform we propose will allow students who may be less “college-oriented” at the age of 16 to pursue an alternate career path which involves hard skill training during the final two years of high school. This training will position a young man or woman to be able to earn a good, living wage upon high school graduation. While current high school graduates have no discernible skill set, these individuals will have specific marketable skills that meet the needs of the economy. These policies, we argue, would promote job growth. Additionally, the nature of manufacturing jobs is changing, and the training provided in the new educational system will empower workers with the skills needed to bring manufacturing jobs back to the U.S. 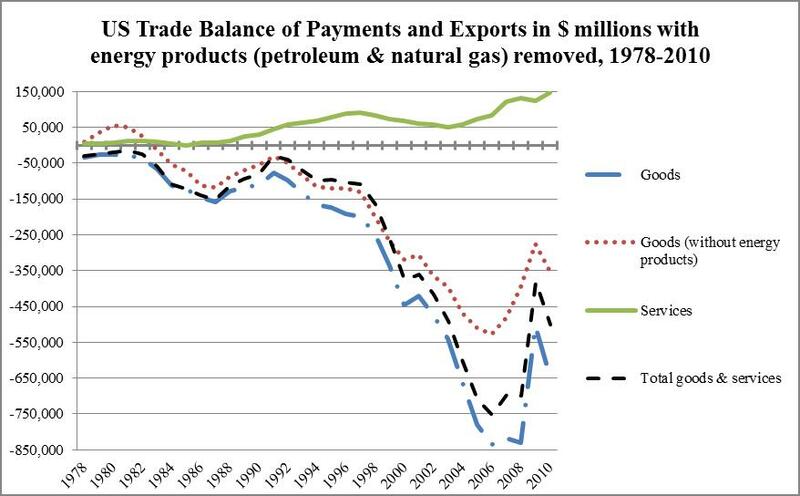 This, in turn, would have a positive impact on the balance of trade, which has declined dramatically along with the shift from manufacturing to services in the U.S. Service exports do provide a positive balance of trade, but they are not nearly enough to outweigh the cost of manufactured goods imports as shown in the graph below; the U.S. needs to do some manufacturing to bring that balance to a positive, which will ultimately reduce the national debt as well. On an individual level, for those who may not be oriented toward college, they will graduate with much higher potential earnings than they currently have. Additionally, these earnings could be used to help fund higher education endeavors in the future and minimize (to the extent possible) the amount of student loan debt required, should they decide to seek a new career path or additional training. This type of retraining, some have argued, could be part of a “new career contract” in the future. By providing a higher earnings potential for high school graduates and making higher education more financially feasible, our proposed education reform increases social mobility for many people of lower socioeconomic-statuses, and is intentionally designed in this way to be advantageous for economically disadvantaged African Americans, contrary to prior apprenticeship programs. It is our contention that apprenticeship programs could still be a valuable and useful tool, but President Obama must be mindful of the history, understand these past failures, and actively work to prevent similar outcomes. A recent study has shown whites now believe anti-white bias to be a larger problem than anti-black bias; additionally, historically, the majority of the American public has opposed the most popular race-based social policy (affirmative action). This puts President Obama in a challenging political situation. When viewing the outcomes of affirmative action, it is notable that diversity gains generally ceased during the 1980s, while Ronald Reagan’s administration dutifully weakened enforcement provisions of civil rights laws and lessened the funding for agencies like the Equal Employment Opportunity Commission (EEOC). For President Obama, these proposed apprenticeship programs are very promising, but in light of the history of these types of programs, significant oversight is necessary to prevent systemic racial bias. Pingback: Apprenticeships must consider systemic racism.